THIS IS FOR BOYS AGES 7-14. Tryouts Tuesday August 7th at 6 pm. Meet at the Southfield park. This tryout will be for open spots on current club teams. It is a fall instructional league and we will fill spots that are needed to complete the teams that were created in the Spring. Later December/January we will have full-team tryouts. Fall Leagues run from August 20th-October 10th. 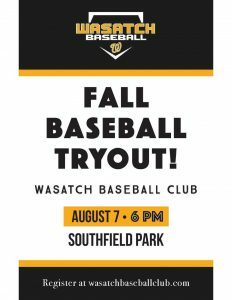 CURRENT Wasatch Baseball Club members do not need to tryout again for the fall league. THIS IS FOR NEW MEMBERS ONLY!